When it comes to keeping tabs on project management, popular upstart Trello has company: Asana, which has been around since 2008 and in public use since 2011. Here’s what Asana does and how it works. Asana was created in 2008 by Facebook co-founder Dustin Moskovitz and software engineer Justin Rosenstein after they saw a need to coordinate teams more effectively inside the social network’s operations. They soon realized that tech giants weren’t the only companies that could benefit from greater efficiency. “It turns out that these difficulties tracking work are universal across organizations: the bigger your team, and the bigger your mission, the bigger your coordination problem,” Moskovitz and Rosenstein wrote in a blog post. The application is now used by 25,000 paying customers, including companies from a number of industries, from Uber and Airbnb to Spotify, Bed Bath & Beyond and even NASA. That’s up from 13,000 in 2016. At a basic level, the cloud-based software allows colleagues within an organization’s Asana workspace to track and manage the progress of projects. For example, workflows can be set up for HR teams to manage the onboarding process for new staff. Asana’s Dashboard provides a high level view of all work under way, allowing users to track progress as individual tasks are completed. Asana’s dashboard also lets users access a high-level view of the status of projects at a glance. The software is relatively easy to use when compared to more complex project management tools sich as Trello and Smartsheet and is aimed at a wide range of business professionals. Asana’s product design is one of its key strengths, said Castañón-Martínez. Asana’s Calendar View lets team leads and individual team members set and view upcoming deadlines for projects and tasks. 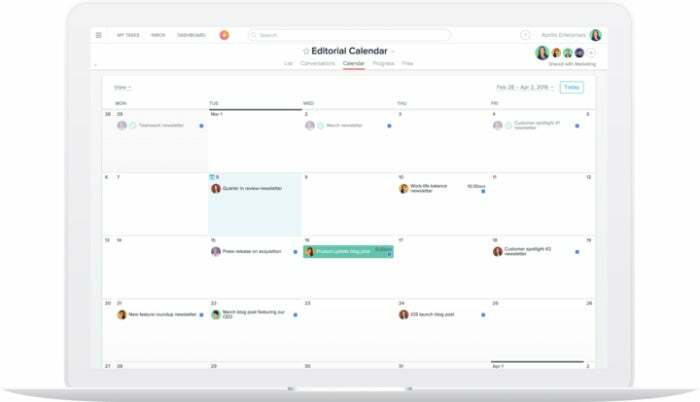 Asana is keeping tabs on project management rivals and even mimics some of the features they offer. 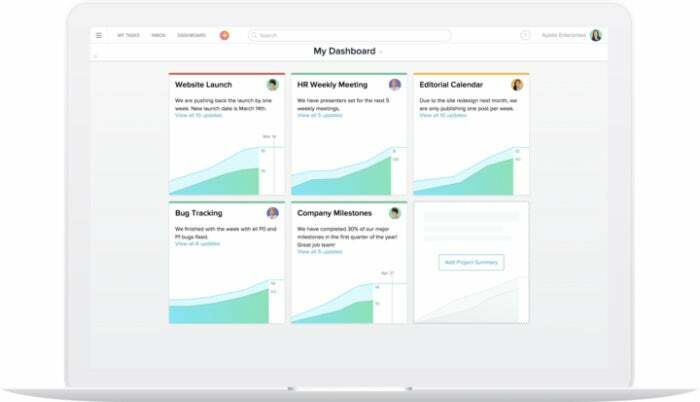 Earlier this year, for instance, Asana added a feature that imitates Trello’s core functionality with the addition of Kanban-style project boards. "We want to give them full credit," said Asana's head of product, Justin Rosenstein. "They have done a great job on executing and creating this easy, visual view. But we see a much bigger opportunity because we basically think Boards is not a product, it's a feature." While there are clear similarities in presentation, Visitacion said Asana has a clearer focus on supporting teams of professionals than Trello. 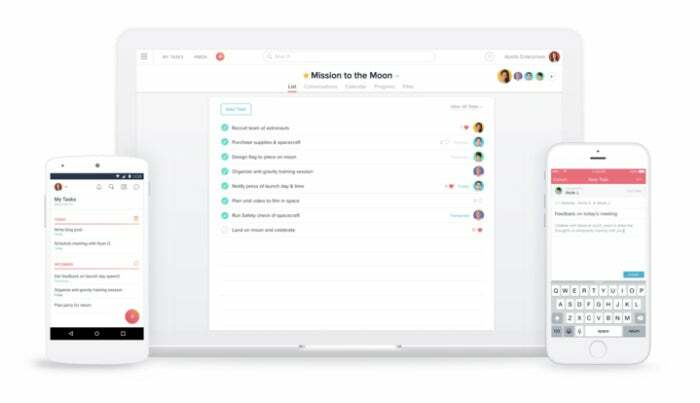 Asana is available through a web browser and a mobile app, with support for both Apple’s iOS – with recent updates aimed specifically at iOS 11 – and Android. It has three payment options: a basic, free version with limited access to features and paid Premium and Enterprise tiers. The free tier supports up to 15 team members, with access to limited dashboards and search functions, as well as unlimited task projects and conversations. The Premium level costs $9.99 per user per month when billed annually and adds features such as admin controls and single sign-on; it also lifts restrictions on the use of dashboards and team size. The Enterprise plan offers more advanced admin controls, custom branding and same-day support. There are also added security and data protection features, including data deletion and cross-regional backups. Prices, depending on which features are included, are available upon request. Those tiers are roughly in line with the pricing for rival Trello, which also offers a freemium pricing scheme, starting with a free basic option, $9.99 mid-tier Business package, and a full enterprise plan. Asana has already launched its first integrations with third-party software providers and now links into productivity tools including Google Drive, Jira, OneDrive, Dropbox and Slack. Google recently announced that Asana will be accessible directly from Gmail. Asana users can access the app through a web browser or on mobile devices, with Android and iOS apps available for download. Asana’s focus going forward is clear: it aims to scale its operations globally and add new enterprise users. In 2016, it announced plans to bolster its staff and improve customer support. More frecently, it has added new features such as custom fields and pre-made workflow templates. The company this year announced senior staff appointments, with Oliver joining from Dropbox as head of sales, and Tim Wan as head of global finance. Wan had previously been chief financial officer for Apigee, leading the company through its IPO and eventual acquisition by Google. The company is also eyeing ways to become more enterprise-friendly. “We’ll be investing even more in IT-admin, security and advanced workflow features to accommodate the growing demand for Asana in large, complex organizations,” said Asana’s head of business, Chris Farinacci in a blog post. Farinacci is a former Google employee. As Asana increases its large-business focus, Castañón-Martínez expects the company to further enhance security features and add even more integrations with third parties. “The company has already been doing a lot of work with this to cement its position as a software vendor to IT,” he said. Asana has its sights set on international expansion. Almost 40% of the company's revenue comes from outside the U.S., as well as 45% of paying customers. With that in mind, it announced on Nov. 2 that it has expanded its EMEA headquarters in Dublin to improve international sales capabilities and customer support, and is launching international localized languages in French and German. Spanish and Portuguese will follow soon, the company said in a blog post.